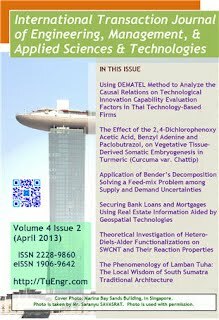 International Transaction Journal of Engineering, Management, & Applied Sc iences & Technologies publishes wide spectrum research and technical articles as well as reviews, experiments, experiences, modelings, simulations, designs, and innovations from engineering, sciences, life sciences, and related disciplines as well as interdisciplinary/cross-disciplinary/multidisciplinary subjects. Original work is required. Article submitted must not be under consideration of other publisher for publications. Goals of the peer-review open-access International Transaction Journal of Engineering, Management, & Applied Sciences & Technologies (ITJEMAST) are to cooperate, report, document and, promote technical as well as advance work in the following but not limit to the fields given below. ITJEMAST strives to meet quality and standard of international peer-review journal. ITJEMAST's International Editorial Board comprises distinguished members from more than twelve countries ranging from diverse disciplines, institutes, and geographic across the world. ::2010 International Transaction Journal of Engineering, Management, & Applied Sciences & Technologies, Some Rights Reserved.